When someone hears or reads for the first time that the inner structure of everything is sevenfold, there is often surprise and the question is posed: ‘Why seven?’ In fact, there is no correct answer to this question, because the septenary is inherent to creation. What we can do, is mention several facts that make sevenfold structures plausible. 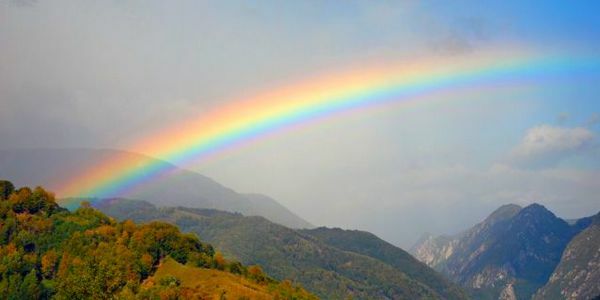 White light that is broken by a prism or breaks through water into a spectrum of seven colours of the rainbow: red, orange, yellow, green, blue, indigo and violet. The musical scale of western music consists of eight tones, the last of which is a repetition of the first on a higher octave: do, re, mi, fa, sol, la, si, do. If you have seven equal circles, for instance in the form of coins, you can place them against each other in a flower pattern, in such a way that the centre coin touches all the other six. A human head contains seven openings and in the head there are seven brain cavities. Our solar system consists, according to astrology, of seven classical planets that correspond with seven classical metals: Sun (gold), Mercury (quicksilver), Venus (copper), Moon (silver), Mars (iron), Jupiter (tin) and Saturn (lead). The planets Uranus, Neptune and Pluto have only been discovered later and are classified under the so-called mystery planets. In the holy scriptures from diverse cultures, among which the Bible, the number seven plays a key role. 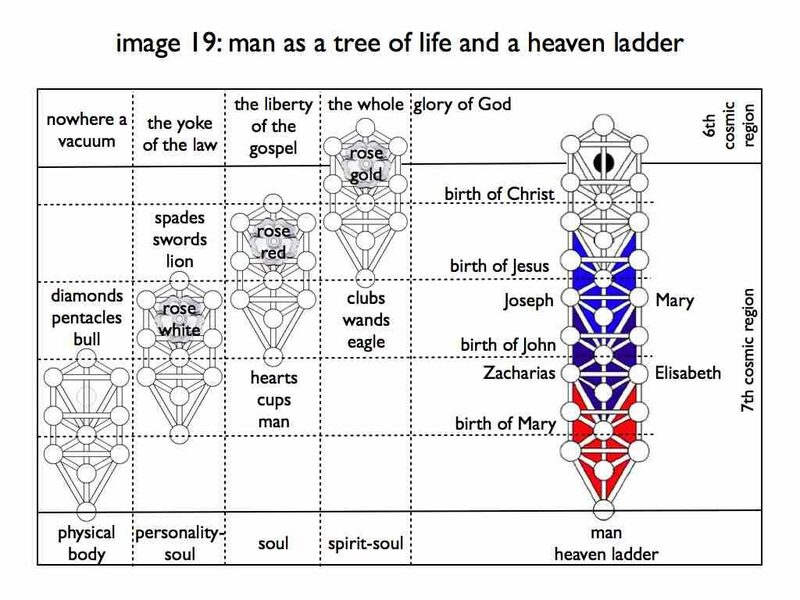 Abstract symbolism systems like the tree of life from the Kabballah and the enneagram, are based on the septenary. Helena Blavatsky mentions in her standard work ‘The Secret Doctrine’ from 1888 in broad strokes the doctrine of the seven rays. Later on, Alice Bailey extensively elaborated on this doctrine in a treatise on the seven rays in five volumes. The seven rays are seven powers that emanate from the universal spirit field, from God, and each of them is sevenfold by nature. The seven times seven rays are interrelated. Catharose de Petri called these seven rays the absolute life, the absolute love, the absolute intelligence, the absolute harmony, the absolute wisdom, the absolute dedication and the absolute act of liberation. Based on the age-old knowledge that seven is a sacred number, all kinds of septenaries have been invented in the course of history. In the Middle Ages, for example, the seven deadly or capital sins were known (pride, greed, lust, envy, gluttony, wrath and sloth), the seven virtues (prudence, justice, moderation, courage, faith, hope and love) as well as the seven liberal arts (grammar, logic, rhetoric, arrhythmic, geometry, music and astronomy). 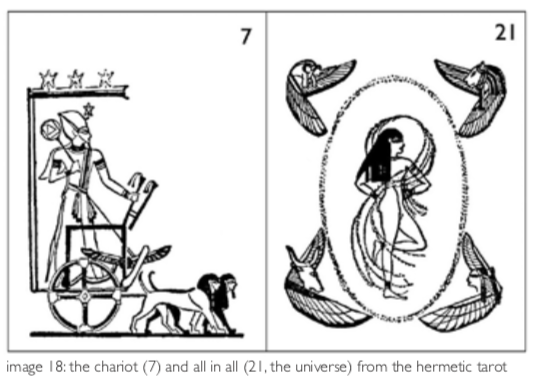 The book ‘The Kybalion: Hermetic Philosophy’, which was issued in English in 1912, under the pseudonym ‘The three initiates’, describes seven principles that govern the universe. Deepak Chopra wrote the popular book ‘The Seven Spiritual Laws of Success’ in 1994. Stephen Covey is the author of the management classic, issued in 1989, ‘The Seven Habits of Highly Effective People’. Max Heindel (1865-1919), who founded the Rosicrucian Fellowship in Oceanside in California in 1909, described in his standard work ‘The Rosicrucian Cosmo-Conception’ from 1909, that there are seven cosmic planes and that humanity has now for a very long time been living on the seventh cosmic plane. According to him, this has not always been the case. Man originates from the sixth cosmic plane and is called to return to the sixth cosmic plane after countless experiences in many incarnations in the seventh cosmic plane. That is possible if he allows all seven aspects of his essence to develop. This way back can be accelerated by following the path of initiation. This representation of things was very functional more than a hundred years ago, and in compliance with what was taught in, for example, theosophy and anthroposophy. In this way people were encouraged to work on their own development. This put an end to, for instance, the ecclesiastical dogma that Jesus solved everything for us through his death on the cross. Moreover, this approach made people aware of the fact that the sensory perceptible world is only a minor part of the realities that can be experienced, and that the many non-perceptible realities can be intellectually understood to a large extent. Heindel acknowledged that his approach was necessarily restricted. In his preface with the title ‘To those who understand’ he writes, among other things: ‘It will never be so that the last word about the world mystery is laid down in a book. The author of this work therefore does not offer much more than the very first principles of the Rosicrucian teachings. The brotherhood of the Rosycross possesses the farthest-reaching and most logical conception of the world mystery, which the author has become acquainted with during his years-long study of the subject. In so far as he can ascertain their teachings are in compliance with the facts as he knows them. He is firmly convinced that “The Rosicrucian Cosmo-Conception” will not by far be the last word on this subject and that, as we advance, an ever-wider perspective of truth will open itself to us and clarify many things that we are now still seeing ‘through a mirror, in riddles’. There are many similarities between the sevenfold classification of man within the tree of life of the Kabballah, the anthroposophy and theosophy. These are represented in the table below, which is by and large right but not totally, because not all systems line up with each other exactly. The ‘I’ or self-consciousness, that is associated with concrete thought, takes a centre position and fulfils a key role in the development of man, as on the basis of that power of thought the astral body, which is associated with desires, can be spiritualised into the life-spirit, which is associated with intuition. And the powers that are active in the physical body can – through the self-consciousness – be spiritualised into the spirit man, who is associated with divine inspiration. Rudolf Steiner (1861-1925) and Max Heindel distinguish within the ‘I’ or the concrete power of thought yet three more aspects of the soul that have been developed in sequence: the sentient soul, the intellectual soul and the consciousness soul. It is important to realise that these three ‘souls’ and the spirit aspects of the levels 5, 6 and 7, are all part of the personality-soul. This sevenfold image of man is actually very logical after studying contemplating it for some time. All seven aspects of the personality-soul are only partly developed. That is expressed, for instance, in the seven little dwarfs in the fairy tale of Snow White, who have to work in the dark mines, symbol of the material world, and are very happy when Snow White, symbol of the soul, comes to live with them. And Tom Thumb too, and his six brothers who are sent into the forest by their parents, symbol of the world of the multitude and of matter, can be regarded as the seven aspects of the personality-soul that can grow when the influence of the false ego, the giant, is neutralised. Rudolf Steiner describes in his book ‘An Outline of Esoteric Science’ from 1909 a visualisation exercise that ends with the meditating person imagining a black cross with seven red roses around the centre. The black cross is a symbol for the negated lower element of the instincts and the passions. The seven red roses, according to Steiner, are a symbol for the refined, purified passions and instincts. We can also consider them as the renewed major chakras which Steiner calls lotus flowers. Max Heindel chose as the emblem for his Rosicrucian Fellowship a white cross against a light-blue background in front of a five-pointed star that is composed of visible golden rays. There is a white rose at the intersection of the cross and seven red roses assembled around it. The blue background symbolises God the father and the golden five-pointed star (pentagram) stands for Christ, who can be born in the student in the mysteries, and also for the resurrection body or the golden wedding robe. The white rose stands for the purified heart centre and also for the purified throat centre with which the creative word can be spoken. The red roses refer to a purification of the desire nature at the cross of the material reality. Steiner has also used this profound mantra of the Rosicrucians in the so-called ‘Foundation stone meditation’ which he introduced during a Christmas conference in 1923, in Dornach (Switzerland). And also in the Rosicrucian manifest, the Fama Fraternitatis, four fundamental principles or axioms are mentioned, which are known as the higher foundation for the construction of the physical body, the personality-soul, the soul and the spirit-soul. These for maxims offer us a wider perspective than what comes forward from the writings of Steiner and Heindel. Steiner and Heindel primarily focused on the development of the sevenfold personality-soul, as the people of their time were able to understand this. Now humanity is ripe to call the soul into being and – on the basis of this soul’s development – vivify the spirit-soul out of the spirit-spark. J. van Rijckenborgh (1896-1968), one of the founders of the School of the Rosycross in Haarlem, The Netherlands, foresaw this and unfolded his vision on the subject in his book ‘The Christian Initiation Mystery – Dei Gloria Intacta’, that was issued in Dutch in 1946. In this book he describes the three seven-circles that man must pass through to be reborn as to the personality-soul, the soul and the spirit-soul. For J. van Rijckenborgh and Catharose de Petri (1902-1990) the spirit-soul was the core of their work and that is why they chose the golden rosycross as the symbol for their work: a golden Latin cross, with a golden rose at the intersection. The golden rose refers to the fully opened miraculous golden flower at the third-eye chakra and the golden cross is the symbol of, among others, the transfigurated personality-soul, transfigured by the spirit-soul, forming a living connection between heaven and earth. The symbol of the golden rosycross has been affixed in the temples of the School of the Rosycross but it is not used in public communications. For this another symbol is used: a circle with a centre point which encompasses an erect equilateral triangle and a square. We can recognise the structure of the tree of life in it. The three higher sephiroth are symbolised by the point in the centre and the seven lower sephiroth by the triangle and the square together. On the central panel of the so-called Kabbalistic Lehrtafel from Bad Teinach in the Black Forest in southern Germany, the symbol of circle, triangle and square can be recognised in the tree of life at the position that is indicated as Daath. Daath is a mysterious position in the tree of life, not an actual sephira, but it can establish a connection between the higher three and the lower seven sephiroth. The Kabbalistic Lehrtafel from Bad Teinach is a triptych that was painted in 1663 by Johann Friedrich Gruber (1620-1681) for the fiftieth birthday of princess Antonia von Württemberg (1613- 1679). She was a learned woman who was part of a small circle of ministers who constructed a world system, or compendium from the teachings of Christianity, mysticism, Kabbalah and the Hebrew tradition. Johann Valentin Andreae (1586-1654), the author of the anonymously published manifests of the Rosicrucians, gave advice with respect to the creation of the Kabbalistic Lehrtafel. Jan van Rijckenborgh was not familiar with the Kabbalistic Lehrtafel, but nevertheless also arrived at the symbol of circle, triangle and square as mentioned above. According to J. van Rijckenborgh it is not necessary to fully develop the personality-soul before one can be nourished by the forces of the sixth cosmic plane. Man in whom the spirit-soul comes to life on the basis of an active spirit-spark, will directly establish contact with his or her divine origin in this current life. ‘The structural process of death and rebirth, defined as the mystery of initiation, presents three times seven or twenty-one aspects. We refer to them as the three seven-circles. Each of these circles has again seven aspects, comprises seven faculties and places the pupil in seven different fields of work. In each of these circles a seven-branched candlestick burns for the pupil, seven fiery principles are handed to him, standing before him as seven angels bearing witness to seven churches. The word ‘church’ we must interpret in the language of the mysteries as a higher field of work for entities who have been prepared for it, and the suggestions, the powers and the potentialities coming after that higher field of work are now brought within the reach of those who yearn for the spirit, who have prepared themselves to advance through fundamental change and persevering endeavour in the right direction. Meanwhile it has been more than seven decades since these words were written. Mankind has progressed, and pioneers are now ripe to comprehend a more accurate concept of the required renewal process which may now be realised in this 21st century. This concept is based on the universal structure of the tree of life of the Kabbalah. As indicated previously, the personality-soul has the structure of a tree of life, of which the highest three aspects are not yet manifest. The body, the soul and the spirit-soul too, can be imagined as a tree of life, in accordance with the Hermetic principle ‘as above, so below’. Within the seventh cosmic plane we can distinguish seven dimensions. The first four are generally associated with the sensory perceptible world and the physical body: length, width, height and time. The other three dimensions encompass and at the same time rise beyond them: the personality-soul, the soul and the spirit-soul. Let us, for example, take a look at arcanum 7 of the Hermetic tarot. That is the triumphal chariot in which the Egyptian god Osiris is transported with great speed towards his aim. This is reminiscent of the throne-like vehicle or merkabah in the vision that the Jewish prophet Ezekiel describes in the first chapter of the bible book with the same name. This throne-like vehicle is the light vehicle with which the journey into heaven to the throne of God, can be undertaken. The Kabbalistic tradition has derived from so-called merkabah mysticism that was practiced within Judaism in the period from 538 bc to 70 ad. The merkabah tradition was based on an esoteric doctrine that was again mainly based on Genesis 1 and Ezekiel 1, in which the mystic had to pass through seven heavens to be able to see the throne-like vehicle of God. In Ezekiel 1 and also in the Revelations of John four winged mystery animals are mentioned, with consecutively the face of a bull, a lion, a man and an eagle. We may regard those as symbols for the physical body, the personality-soul, the soul and the spirit-soul respectively. All these dimensions reveal themselves as a sevenfold, but are, in line with the tree of life, tenfold. In the Hermetic tarot the four mystery animals can also be found on arcanum 21, all in all. (see image 18). Image 19 may well be the most important image in this book, because much can be gleaned from it. Various mysteries are amalgamated in this image, because it quite clearly demonstrates how levels of diverse dimensions overlap, thus making spirit-soul development possible. The four trees of life merge into each other and together form a connecting path between the sensory perceptible world of the seventh cosmic plane into the sixth cosmic plane. It requires quite some thought to attain a deeper understanding of image 19. There were and are Kabbalists who daily meditate on the four trees of life and their relationships. André Peters describes in his Dutch book ‘Kabbalah, a Contribution to a New Psychology’, that in earlier times Kabbalists who travelled elsewhere liked to take a picture of the tree of life with them for their meditations. 10 cards with rods or clubs for the tree of life of the world of Atziluth, the world of spiritual experience which corresponds with the spirit-soul. These forty cards together form the way that man can go to transform into a spirit-soul man, a temple of the spirit. They can be associated with the 40 years that the people of Israel needed to reach the promised land from their slavery in Egypt, through the desert. The hidden sephira Daath, which strictly spoken is not a sephira, becomes active in a tree of life when the tree of life of the next higher dimension is vivified. We can see that in image 19, where Daath of the personality-soul is at the same level as Yesod of the soul. That means, among other things, that the soul can become active in the personality-soul when it opens itself to the archetypes in the pure astral world of the soul. Daath is also associated with the planet Saturn, the gate of Saturn and the awakened spirit-spark that may manifest itself in various dimensions: as the white rose of the personality-soul, the red rose of the soul and the miraculous golden flower of the spirit-soul. We conclude this essay with a passage of the book ‘Seven Voices Speak’ by Catharose de Petri.